Oil on panel, 48 x 55 cm. 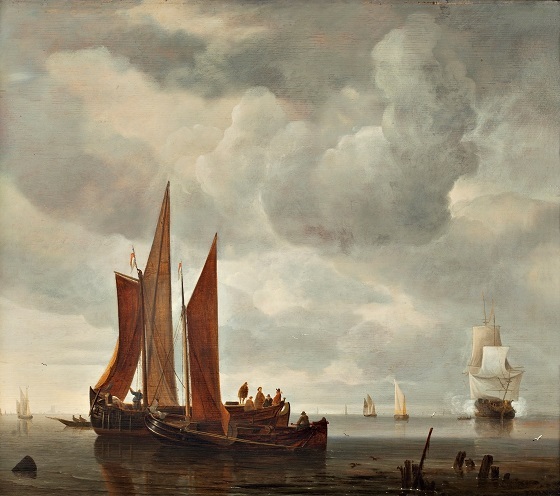 In this scene, the marine painter Hendrick Dubbels depicts a windless day by the coast of Dordrecht, with two large riverboats with red sails gliding along the water. A warship fires a salute at an approaching boat on the wide river. Further in the distance several more ships can be seen, while Dordrecht’s Church of Our Lady can be just barely made out on the far horizon towering over the flat coast. The grey, cloudy skies over the low horizon dominate the scene, adding a certain dynamism and movement to the otherwise peaceful and tranquil motif. The grey tonality which characterises most of the composition bears witness to the influence of his contemporary colleague, Simon de Vleiger.